The Ergon TP1 Cleat Tool for Speedplay, Shimano SPD-SL, Look Keo and Crank Brothers pedals is the perfect tool to improve your cycling ergonomics by adjusting the cleats with high accuracy in a few simple steps. I’m riding Speedplay Zero Stainless pedals (since 2003) and bought me a pair of Sidi Wire Carbon Vernice shoes with a Speedplay specific sole. I will use the Ergon TP1 Cleat Tool to install a pair of new cleats and improve the ergonomics on my road bike. I’ve purchased the Ergon TP1 cleat tool for Speedplay pedals at the Bike Components web store. 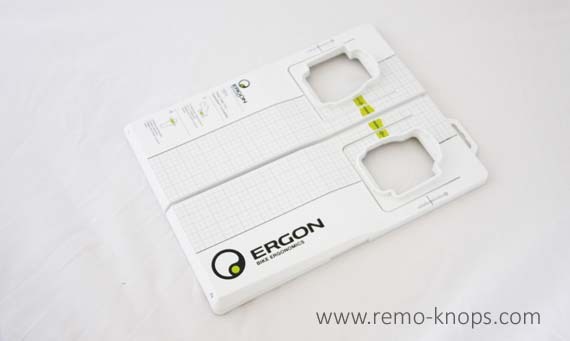 The two half’s of the Ergon TP1 cleat tool were folded together and fitted a plastic packaging with Ergon Bike Ergonomics label. You will notice an optimal cleat installation guide and a set of green Ergon Reference Point stickers inside the Ergon TP1 cleat tool after you open both half’s of the tool. I took the time to carefully read through the optimal cleat installation guide, to properly understand the steps needed to optimize cleat position. Adjusting the your cleats for a more ergonomic and efficient pedal stroke you need to follow these two set-up steps. The advantage of the Speedplay system is that you don’t need to deal with the angle of the cleat (as with the 3 bolt Look Keo or Shimano SPD design). So it is a simple two step process that doesn’t require a lot of fine tuning. I’ve placed a Ergon Reference Point sticker to mark the center of the big-toe-joint on the outside of my left and right Sidi Wire Carbon shoe. You can also use a 3M Post-It note to mark this joint-center. Second I’ve put a little carbon Dynamic Assembly paste with micro-pearls on the carbon sole and placed Speedplay’s Carbon Sole Protector Kit on top of the assembly past. The next layer on top of that is the Speedplay Zero cleat and hand tighten the 4 bolts in such a way that the cleat still can be moved. Now you open up the Ergon TP1 Cleat Tool and put your shoe with cleat (and shoe) in the cut-out of the Ergon TP1 Cleat Tool. Adjust the fore/aft position in such a way that the center of the big-toe-joint (marked with the Ergon Reference Point sticker) is at the center of the pedal axle. You can clearly see the center of the pedal axle on the Ergon TP1 Cleat Tool. The grid of lines on the tool makes it possible to easily and accurately adjust the cleats. I did some control measurements (for both left and right leg) with a plumb line over my knee-joint on the Tacx Satori turbo trainer. With the center of the big-toe joint above the pedal axle it is now time to adjust the lateral position of your feet compared to your cranks. While the so called Q-factor should be as small as possible, the position of your feet and knee should provide a natural movement without over stretching your ankle and knee joints or any pain during the pedal / crank rotation. With help of measurement scales on the pedal axle of the Ergon TP1 Cleat Tool you can set the foot stance. In my first attempt I did set the foot stance to small, and you immediately notice a unnatural movement of the knee during a test ride on Tacx Satori turbo trainer. So I simply adjusted the Q-factor a little. This adjustment was small and without the Ergon TP1 Cleat Tool it would have been hard to do this adjustments in a structured and accurate way. In the second adjustment attempt I did optimize the Q-factor, by keeping it as small as possible without any pain in knee. Contact points between rider and road bike and a proper fit are crucial for a good performance. With the purchase of a pair Sidi Wire Carbon Vernice shoes with a Speedplay specific sole, it was necessary to (re)adjust cleats and saddle position (because the Speedplay specific sole offers a lower stack height). The Ergon TP1 Cleat Tool is available for most common pedal systems, but certainly not all pedals (for example the Time RSX line). Is the Ergon TP1 Cleat Tool worth the price-point of E20,– ? Yes it is. The Ergon TP1 Cleat Tool helped me to do accurate and small adjustments of the cleats, that were impossible to do without such a tool. Hey!, I found this information for you: "Ergon TP1 Cleat Tool for Speedplay, Shimano SPD-SL, Look Keo pedals". 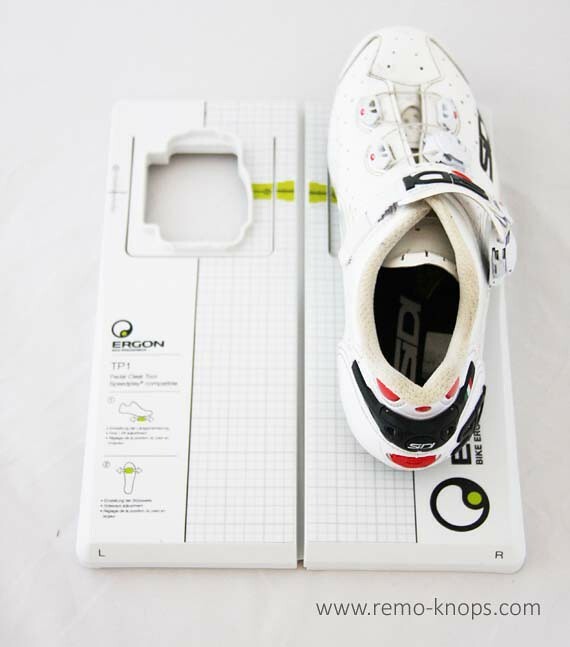 Here is the website link: https://www.remo-knops.com/5149/ergon-tp1-cleat-tool-for-speedplay-shimano-spd-sl-look-keo-pedals/. Thank you.